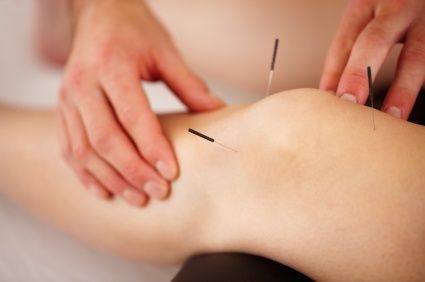 Dry Needling is a therapy used to desensitize supersensitive tissue and structures, restore function and motion within the tissue, and promote a healing response. It has been used to successfully treat anywhere from chronic pain to MS, and strain/sprain injuries. Using a ‘’dry” needle, or a needle without medicine in it, the therapist can actually feel trigger points deep in the muscle tissue and receive feedback on the quality of the tissue, which helps to diagnose and treat the injury. Trigger points are associated with tight muscle bands that can cause muscle spasms, or radiating pain to other nearby areas. A muscle injury such as over use or a repetative strain can result in a trigger point. First, the physical therapist will palpate for a taught or tense muscle band and then insert a thin needle, which is covered by a tube, into the muscle tissue. The needle is gently loosened from the tube and the top of the needle is "flicked" allowing it to penetrate the skin. The needle is guided toward a trigger point unitl a muscle twitch, which is an involuntary contraction resulting in an alleviation of the muscle tension, is produced.